Quilt, Knit, Run, Sew: When it's time to go, it's time to go. When it's time to go, it's time to go. The weather in Florida has been exceptional this winter. We have had so much fun here in the community and it seems like we were busier than ever. We loved having some visitors this year. The best was having my grand kids were here for March break. Besides suntanning and swimming, we played shuffle board, went for dance lessons, went bowling with the big balls, and we can't forget the afternoon milkshakes. They loved having their own transportation around the community. 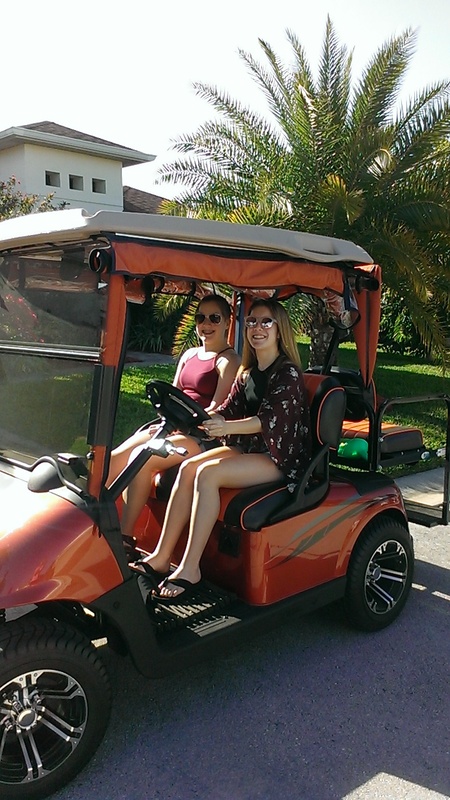 Everyone here has a golf cart. It's a large community. It would take 30 minutes to walk to the pool. So the carts are a must here. They also loved just going on the lanai in the mornings with their breakfast. Feeling the warm morning sun on their face was so welcome. The kids want to live here, but it's too bad for them. To live here, you need to be of a certain age. But you can visit all you want..
Well the kids are gone now and the countdown is on. Most everyone's visitors are gone too and the conversations around the community are about who is leaving when and how long their drives are. Now not everyone leaves, the majority of our friends are leaving. Each year, my circle of friends gets a bit wider. Most are sewers or quilters and I haven't even left year and can't wait to see them next year again. Even with all that fun and community, I am now looking forward to coming home. I have a busy spring planned and I'm chomping at the it to get back in my sewing room. I have all kinds of projects swimming around in my head. I think I should start making some lists. That way, I won't wake up in the middle of the night with things to add to my virtual list. Looks like the girls had lots of fun on their visit! Have a safe journey home! Yippee... can't wait for you to come home. Have a safe trip home Gail. White or Blue - That is the Question!